Broadway Review: "Memphis, A New Musical"
One thing is certain about Memphis, the new musical that just opened at the Shubert Theatre, you’re toe won’t stop tapping from start to finish. The score is infectious at times and occasionally annoying at others (“She’s My Sister”). 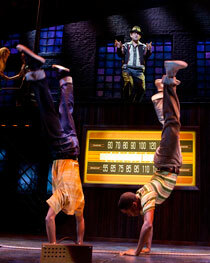 It also has one of the most energetic and hardest working casts currently on Broadway. Unfortunately, both of these things don’t help the hokey story line. Memphis is set in the early 1950s and tells the tale of love, race, ambition and the divergent paths life can lead you down. Huey is a white man in love with soul music or “the music of my soul” as he puts it. He falls for Felicia, the black woman he hears singing at a blacks-only club. Well, it was blacks-only until Huey came along. He promises to get her on the radio which he manages to do. The two fall for each other despite the protestations of her brother Delray, the owner of the club where she sings, and his mama. Memphis is haunted by the ghosts of other musicals before it. There are hints of Hairspray and Dreamgirls. It tackles the subject of racism and interracial love in a parochial and provincial way and doesn’t cover any new ground. One thing it inadvertently did, for me anyway, was hold up a mirror to reflect the current struggle in the gay community for marriage equality. The show has also been tripped up by the Achilles heel of musical theatre, that allusive perfect ending. I’m sorry to say that the show doesn’t have a very satisfying ending. The book and lyrics are by Joe DiPietro (The Toxic Avenger), based on a concept by George W. George. The book has its lighter moments. The music and lyrics are by David Bryan, a Grammy Award winner and founding member of Bon Jovi. He also co-wrote The Toxic Avenger with DiPietro. Despite its shortcomings, I dare you to see this show and not enjoy yourself. If the reaction of the audience the night I saw it was any indication, you will. 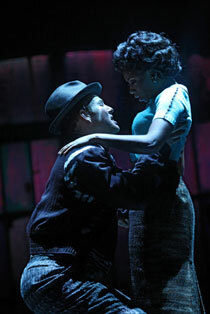 The cast of Memphis is terrific. As Huey, Chad Kimball is a one-man dynamo whose comedic sensitivities and mannerisms remind one of a young Robin Williams. Kimball sings, dances and charms his way through the show with aplomb. Montego Glover plays Felicia, Huey’s love interest, with a sharp wit and a stellar singing voice. Her over-protective brother Delray, played by J. Bernard Calloway is an ominous presence who never does warm up to the idea of having a white brother in law even after he makes her famous. The lovely and funny Cass Morgan plays Huey’s similarly disapproving mother. Michael McGrath is terrific as the cranky station manager. The entire cast is so good it almost feels inappropriate to name any of these talented folks by name. The cast is accompanied by a hot band under the direction of Kenny J. Seymour. As the audience walked out at the end, they lingered to hear the band play the end of the walk-out music and then gave another hearty round of applause. The scenic design by David Gallo morphs smoothly from the sound booth of a radio station, to an underground soul club, to a lily white department store. It does feel a little big for the space and this affected Sergio Trujillo’s phenomenal choreography. The amount of playing space the cast has on the stage is minimal after you subtract for the tremendous set with its multiple columns. Paul Tazewell’s costumes were spectacular. They capture the style of the day and are just plain gorgeous. Director Christopher Ashley (Xanadu) has guided this production with a deft hand and imbued it with ultra-hgih energy. Mr. Ashley is currently the Artistic Director at La Jolla Playhouse.